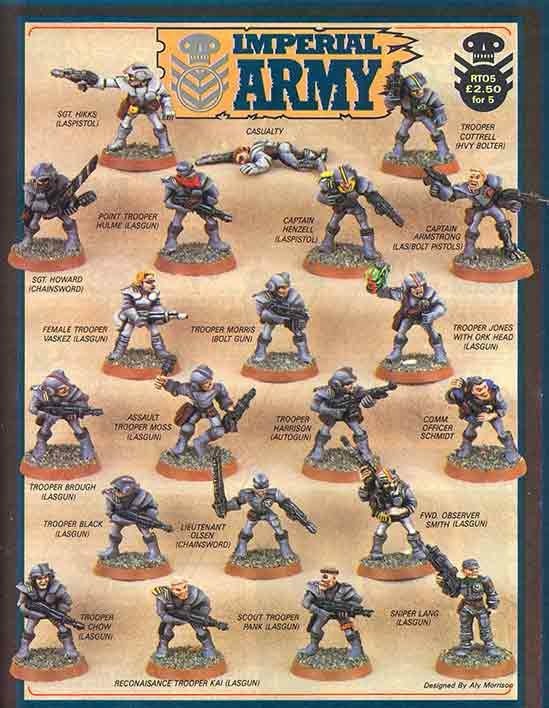 The Paranoia miniatures produced by Citadel from 1985-1987 are among the most under-appreciated ranges produced in the golden age of Games Workshop. Paranoia is a post-apocalyptic game set in a subterranean city combining the surveillance of Orwell, the bureaucracy of Kafka and the sensibility of Spaceballs. But more than this, Paranoia was the first meta role-playing game: a game that mocked and inverted the conventions of other RPGs. Nothing in that game was fair -- for instance, my first character was slain by a random encounter named "Wandering Damage". Indeed, player characters were actively discouraged from even learning the rules of the game, since that could be interpreted as seditious knowledge. The result was a game that promoted willful ignorance, uncertainty and betrayal among players, all in the name of good fun. 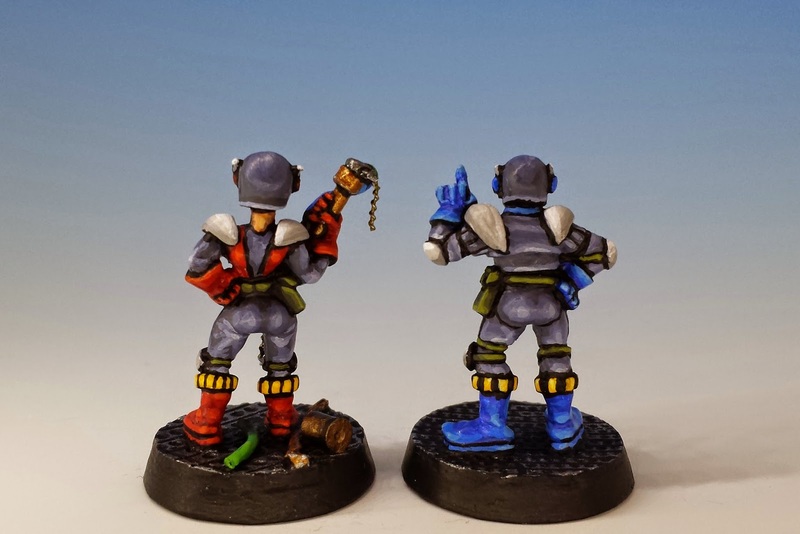 When Citadel obtained the licence for Paranoia miniatures from West End Games, it had a great excuse to explore the comic possibilities of miniature sculpting. The results are almost unequaled for humor: neat, simple figures in overalls or padded armour, each one convulsed with despair, terror or denial. Some models are attempting to defend themselves with vacuum cleaners -- some are paralyzed with indecision -- some are just running for their lives. They remind me of how I would look if I was being attacked by an alien menace. 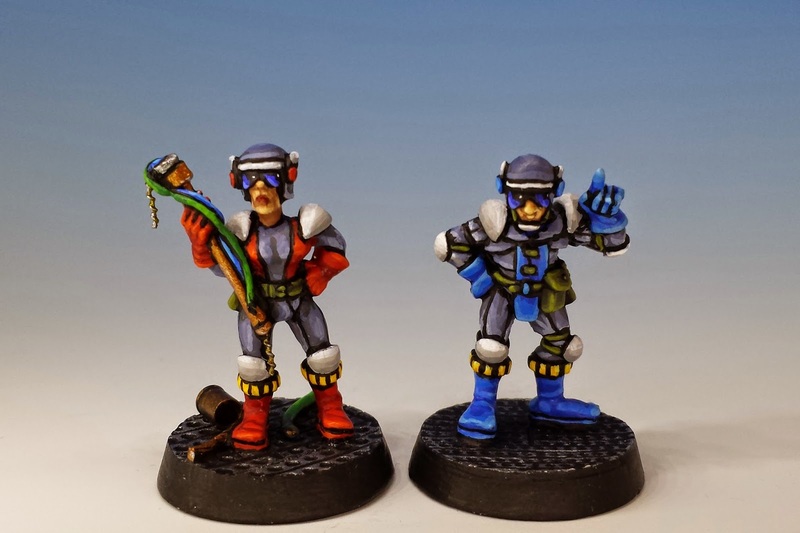 In this sense, these miniatures are a refreshing antidote to the grim, heroic figures that populate most fantasy and science fiction, including Warhammer and Rogue Trader. Sadly I can't find any evidence about who sculpted these miniatures. My suspicion is that Aly Morrison is the guilty party. The pronounced cheekbones and gangley limbs in the Paranoia figures are Morrison hallmarks. And the Paranoia figures also bear a striking resemblance to some of Morrison's early Imperial Guardsmen, leading to the intriguing question of how Paranoia's aesthetic influenced the development of Warhammer 40K's Imperial Army. In any case, Morrison was always the most impish of Citadel sculptors, so the Paranoia figures would be in his wheelhouse. So stay tuned for a brief discussion of Space Alert in my next post. Very interesting post. I remember getting a paranoia fig in the boxed set......but I don't think it was one of these. Did someone else do a range as well? The laughing fig is amazing. I quite like him. Obviously he has been properly dosed with Eezee-Does-it pills by the morale officer. Ready to charge the nuclear plant that is traitorously melting down. The first guy is really great. No purpose other than to laugh manically. Or maybe maniacally? Daveb - regarding other ranges of Paranoia figures... Way back in the 1980's, Grenadier released some Paranoia miniatures, but they are only so-so: primitive sculpts, generic sci-fi costumes and odd proportions. 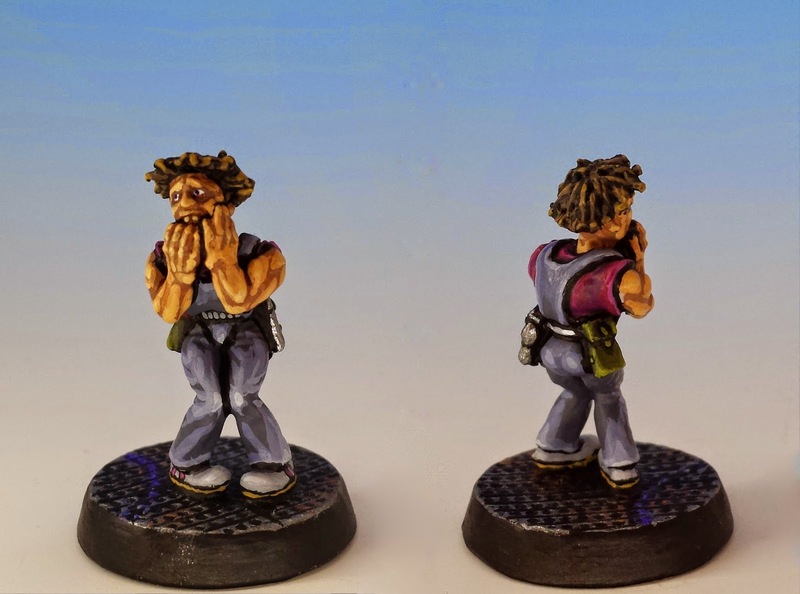 But more recently (circa 2004), Mongoose released some beautiful Paranoia figures -- great miniatures sculpted by Bobby Jackson. 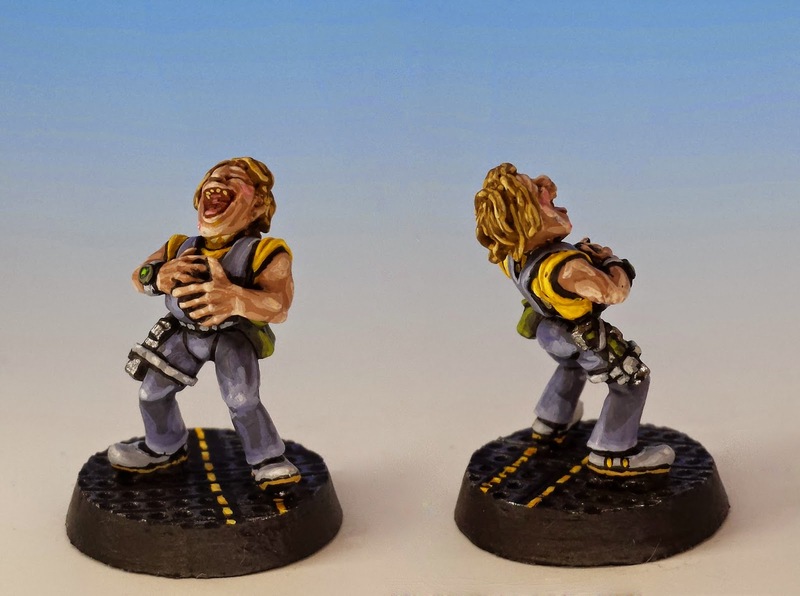 They seem to get mixed up with Citadel minis on eBay sometimes. Anyway, they are great, and I'm going to put up a pic of one in my next post. Interesting post, I've read a bit about paranoia on some other blogs but the history of the figs just wasn't there. Thanks for posting, looking forward to the space alert post. Only found out about Paranoia about a year ago while surfing on the internets. It passed me by when it was originally released, it received minimal to no support here in Australia. A shame really, as the range look like their full of character. I'm a fan of the Paranoia Roleplaying game, but never had an opportunity to get a good look at the figures before now. Thanks! It's not surprising that these miniatures escaped a lot of people when they came out - I don't think there were any dedicated ads for them in White Dwarf - just a couple shots among other new releases in WD 83 and 89. The most important "advertising" was probably the most excellent Warhammer 40K Rogue Trader / Paranoia cross-over adventure in WD 112 entitled "Vulture Warriors from Dimension X Meet Plenty of Cheerful Orks with Plasma Cannon" (VWDXMPCOPC). Incidentally, VWDXMOCOPC was one of the last 40K scenarios to require a Game Master. I've an old copy of WD with an amazing Paranoia scenario that involved Daleks and a malfunctioning computer. I recall it being very tongue in cheek and it's great to see that the miniatures reflect this! Great paint jobs on them too.